Legend: Eternal Life, Aspires, Ascends, Restricted, Bound. Medicinal Qualities: The high climbing single colour Ivy makes a poultice for blisters and other skin conditions, bee stings, spider bites etc. Is good for womens infections. Bare leaves for grazes and burns. The variagated two colour leaf is good for ear infections, coughs, chest infections and the such. Totem Entities: The Salamander, Snake, Horse, Swans. The spiritual meaning of the Ivy comes from its independence, its determination to outperform itself. The Ivy will cover the forest floor and grow as high as the tallest tree, the Ivy is the olympian and will outperform anything. The Ivy is much misunderstood and is assumed that it strangles the host it climbs. It uses the host to climb and is a master of photosynthesis it takes no nutrients from the host, the damage is done by the Ivy blocking the light from getting to the host. The Ivy lives for hundreds of years and like a snake sheds it's skin, the Ivy constantly sheds it's leaves to regrow. It does not strangle the host it simply out performs it, once the host no longer serves a purpose it will move on. The goddess Semele was consumed in flames, her son devastated at the death of a nymph turned her to Ivy giving her eternal life. As the two strands of DNA work together creating, the ivy continues to search, seek and find new ways to climb. It represents mans search for itself, to look within and survive. 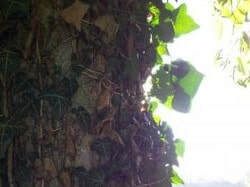 The Ivy can set root in tree, rock and crevice alike with one strand climbing and establishing itself before the second strand grows to provide strength for the first to continue to climb. As a human can claim independence and crave solitude, without pro-creation the independence cannot be maintained. The original Hippocratic Oath begins with the invocation "I swear by Apollo the Physician and by Asclepius and by Hygieia and Panacea and by all the gods." Where as Asclepius is a Deity associated with healing and one of his temples is on the isle of Kos, the symbolism representing him is the snake climbing his staff. 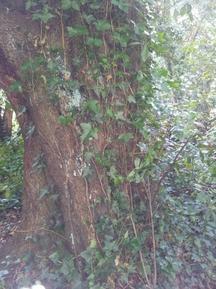 As the Druids understood nature and it's remedies, Ivy is known for it's poisonous berries. The forest floors of the ancient Prydain forests would have been an abundance of Ivy. As the Vine came into it's own last month, the Ivy comes into it's own this month. The time to harvest Ivy is after the first quarter of this months moon. The Waxing Gibbous from day 7 to 13 leading into the full moon, this will ensure the positivity is infused into the garlands made, as they are prepared for the seasons festivities. Leaves placed in a bath during this time will help with any inner turmoil going on and will help settle outside energies and prevent them from interfering with your own.